Marketers are constantly struggling to understand which marketing channels and tactics are driving traffic to a website. So what are some steps you can take to improve the analysis of your marketing channels? Here are some tactics you can use to track your campaign. To start, you should know that Campaigns are a series of marketing tactics that are done in different channels to achieve a marketing goal (sales, sign-ups, views, etc.). That leads us to step 1. 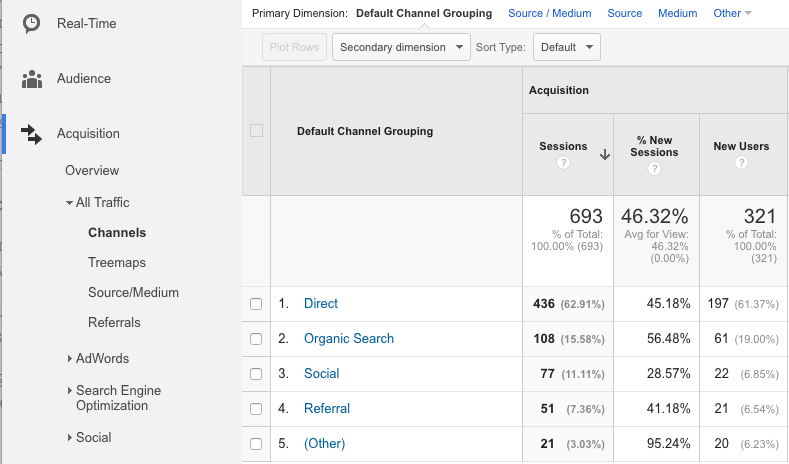 Google Analytics defaults visitors into pre-built channels. Channels are categories like Display Advertising, Social Media, Email, Paid Search, etc. More about Google’s definition of channels can be read about in another article. However, the level of granularity for channels can lack what’s needed to truly optimize marketing efforts. To get to the next level of analysis you have to structure, tag, and track your data accordingly. This can be a confusing and time-consuming process in Google Analytics if you don’t understand how Google organizes your data, how it can be improved, or how you could be accidentally making your data worse. 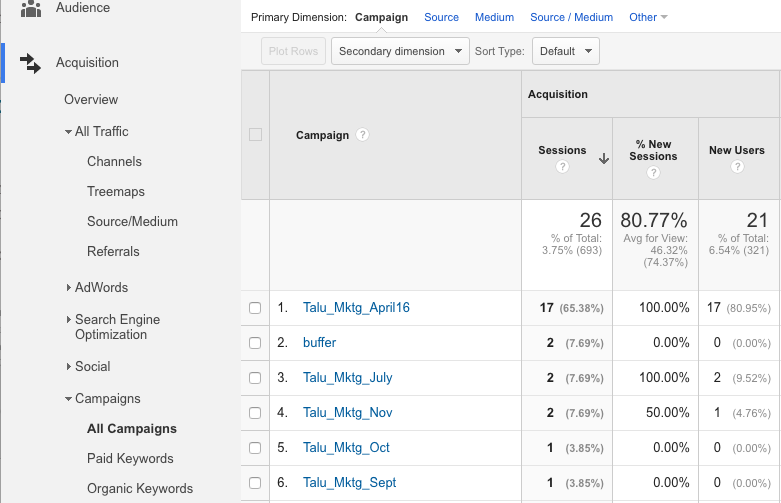 Using “Campaigns” in Google Analytics allows you to structure your data so you can collect data properly and get a true view of the performance of a specific marketing campaign. The best way to set up Campaigns is to start with a high-level marketing perspective; the data should be mapped to relatable and meaningful business questions. Is the campaign focused on one product? Is the campaign focused on one company? Is the campaign around a certain sale or event? How long will a campaign run? What is the goal of the campaign (sales, sign-ups, downloads, etc.)? The campaign focuses on a holiday product special with a 20% discount for an electronics product. The marketing team will start off using four different tactics/channels for promoting the product. Here is a visual of our campaign and tactics to see how it all maps out. A software company launched an updated version of their product which includes new features. The marketing team will work hard to promote the new features over the next few months to see if that drives additional awareness for the product and ultimately people to sign up for their free trial. A marketing team is putting on the yearly BBQ competition for their city. They want as much exposure as possible so people sign up for the competition or buy tickets for the event. By mapping out our campaign in relation to how we’re going to advertise for our company, product, or event, we are naturally organizing our data in a way that we can understand and will flow nicely when we tag and track it with Google Analytics. UTM parameters are the tags Google allows you add to the end of your URLs in order to inform Google how to better categorize your data and improve accuracy. Tags provide a greater level of visibility for your web traffic than just using Google Analytics’ default approach for visitor traffic. The default approach alone would not allow true channel optimization. Using UTM parameters help you achieve a greater level of transparency. It takes a little bit of patience and prep to get your UTM parameters right, but once you do your data will start to make a lot more sense. In order to start this process, we will introduce you to the different parameters that Google allows you to use with your tagging. Once we introduce you to them, we will apply them to our campaign examples above so you can see how Step 1 and Step 2 tie together. The five different types of tags that Google use are added to the end of your URL structure. Google Analytics sees these tags and overrides its default information with the information provided in the links. Campaign is the name of your marketing campaign. We will discuss below how to accurately name these and apply them to your tags, but for now, we are just introducing the concepts. Medium is how someone found your site: email, social, banner, affiliate, etc. Source is where your traffic came from (Facebook, WSJ.com, USAtoday.com, Yahoo, etc.). This is the exact location of the link the user clicked to get to your page. Let’s say we are going to a Christmas Party. 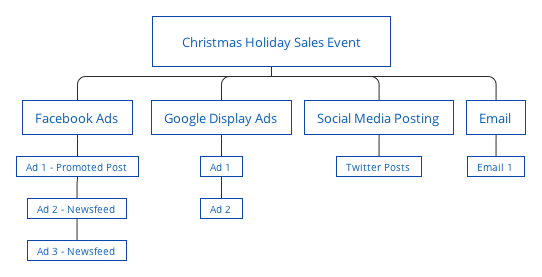 The marketing “campaign” or event is the Christmas party. The “medium” is the mode of transportation we used to get there. The Source is where we came from to get to the party (our house, office, friends house, etc.). In the above image we took the basic campaign information outlined and started to overlay the three main tracking codes in Google Analytics. Now we have a structure of a Campaign Name, the Medium to support our tactics, and the Source of each of those tactics. If we implement this alone without any of the other tags that Google Analytics provides, you will vastly improve the data and insight into your metrics. Additionally, we broke social into two separate mediums: paid social and social. This is important as our “paid” social traffic is much different than our organic social posting traffic and it’s important to differentiate between the two. The naming convention we use for our mediums and source will be expanded on below and through another post that goes into best practices in naming and structuring your UTM tags. There are many pitfalls when dealing with this type of data so it’s important to come up with a series of best practices for naming so you don’t duplicate or mismatch data. Now that you have a general understanding of how to tie your marketing campaign and tactics to the 3 most important UTM tags that Google Analytics uses, how do you actually build the URL to make this all work? Creating the tagged URL link is not particularly challenging, it’s the managing of these links over time and best practices for naming conventions where people typically run into trouble. For the actual creation of the link, Google provides a link builder tool on their support page to help you (https://support.google.com/analytics/answer/1033867). The link starts out with the actual URL: www.company.com/. The " ?" then identifies the start of the UTM tagging, and is the initial signal to Google Analytics that it should see some parameters to read. As mentioned, there are at least five potential parameters but three that are “must haves." We used the three to complete the link for example. You can see the campaign name at the end of the link "&utm_campaign=christmas_holiday_sales_event"
Keep everything lower-case: Tagging is case sensitive so using upper and lowercase together in one instance and not in the other means you’re creating a separate tag and will yield inaccurate data. Avoid mistypes: Mistyping a word creates duplicate links and data. It is hard to discern but, “paid social” with spaces has “%20%20” twice for two spaces and below that “%20” once with one space. You can quickly duplicate or cause data issues by not using the underscores. Underscores make it easy to identify if you have more than one character. You don’t have to use them to make this work, but it is a recommended approach for data integrity. The differences would be to the “source” and “medium” combinations, see the chart below for the four links and the medium/source combinations that the links would have. How does this change for a campaign that has a tactic with more than one source? Campaign 3 would have a minimum of seven links - five for each tactic and an additional two for the other sources based on the social media posting. One link for each source with the same medium. Since there are three different sources possible for the one tactic, you would have to create a minimum of six links to accurately track everything for Campaign 3. (1 link = 1 tactic) + 1 additional link for each source of every tactic. As we talked about earlier “mediums" have one to one relationships, but “source" has one to many relationships. The content field can be used for multiple things. Think of it like a “freeform” tag that allows you to hone in on some specific details so your data can be taken to the next level. The term tag was originally designed around paid search campaigns so you can identify the keywords you bid on. If you are using Google Paid Search and have auto-tagging turned on, Google automatically adds the keywords into this field for you. If you’re not using paid search you could use this parameter as another “free form” field to get more specific on testing. It’s important to use these tags with a uniform approach or again, it could start causing confusion with your data. You can get as sophisticated as you like, but keep things simple until you see a business need to make things more complicated. Most people get a ton of value by just using the three main pages (campaign, source, medium). Many marketing tools might automatically tag some of the links they create for you. While this is helpful, there are some scenarios where auto tagging could be harmful. The main issue with auto-tagging is the methodology of the software provider might not align with your tagging conventions and it will ruin your data structure and integrity of your overall campaign. If you have one channel that’s not properly labeled or labeled differently it will change your data set and reporting, defeating the whole effort you’ve made. Many of the tools that auto-tag are just trying to help you and make it clear which traffic is being driven by those tools, but they operate in a vacuum of everything else you are doing leaving a “data gap” that will cause you problems. So how can you handle these situations? Google provides auto-tagging for all of its services. It integrates nicely with Google Analytics so the best practice is to always use the “auto-tagging” feature and not try to overwrite it. However, for this to sync up with the rest of your efforts you must label your campaign name in Google the same way you have done for your other channels. Many of the email providers like MailChimp will auto-tag the links in your URL as well. While it’s great to have it tagged in some way, otherwise it would be counted as “Direct” in Google, using their default tag structure will rarely sync up with your overall tagging strategy. Many times they will default the “campaign” name to what you named your email campaign. So in some cases if you name those the same you might get your data to sync up, but many times they also append additional information to your name like the date of the campaign or some other identifier which would then introduce the data issues we discussed. In these cases, it’s best to use your own tagged links and turn off their auto-tagging or specifically set their tools to align to your methodology. Each tool is different so you will have to explore each one to figure out the best approach. Some of the social media posting software like Hootsuite also tag and shorten your links whenever you use their tool to post to your social media channels. Hootsuite has it’s own shortening service called ow.ly that tags your links with certain parameters to improve the reporting within their tools. As explained for the email providers above, if this is not tagged to your methodology or naming convention the cross-channel data will be worthless to you, or at least a lot harder to analyze and parse in one report. Most of these services will let you customize or add your own tags to sync with the methods described above. You can also use a UTM parameter tag as the main URL that the service asks you for and then they will shorten it automatically. Our recommendation for these type of services is to provide them with a URL that has UTM parameters already in them. Even if they shorten the link, it will still resolve to the address you gave them and the tracking will stay intact for you. The main thing to guard against other tools potentially messing up your approach is to tag all your links before you put them into another tool or shorter like ow.ly or bit.ly. If you are posting from other social networks directly with their apps the same thing applies. Twitter will shorten links and usually will see it referred to in Googles Analytics as “t.co”. If you add in your UTM parameters into the Twitter client you will be able to get the proper tracking through to Google Analytics. If you don’t, Twitter and Facebook will still be counted as the source of your link, but you can’t compare it across channels for one campaign. It means you lose an important piece of information for cross-channel optimization and analysis. Now that everything is tagged correctly how do you leverage your data in Google Analytics? There are a few different reports that will be impacted by your tagging approach. Most directly you can now look at your Campaign report and to see how your direct campaign efforts are driving traffic across all tactics and channels you are using. To get a complete view of this, go to the Campaign report and add the Source/Medium dimension to it (see below). To get a view of all your traffic across all channels including traffic from your campaigns and other traffic, go to your Acquisition report that specifically calls out Source/Medium. Now that your data is tagged you’ll get a much better overview of your total traffic and how much of it is being influenced by your campaigns. In our campaign layouts above we outlined some specific goals. For example, in Campaign 1 our Christmas Holiday Campaign, the goal was for a visitor to convert and purchase the product. Now with the added tags you can truly optimize your channel conversion all the way down to which channel is best engaged to convert your customers. Without these tags many of your goals could be associated with “Direct” or “Referral” traffic which might not be the case. Using the report below you can now better reflect on what is actually converting for you and start attributing Cost of Conversion metrics to each of these channels and sources. That’s a complete overview of how to best structure your marketing campaigns and translate that back into a usable data structure in Google Analytics using UTM tagging and custom links. Check back soon for another post that explains best practices for naming your tags.